Helping you keep track as we add new material for the exam, week by week. Download a full exam, including listening test audio, from Cambridge English from this page. Find a selection of exercises and some very good samples on this website. 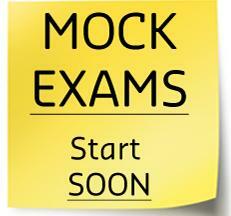 These Links are repeated at the Exam Hub. Find a complete UoE to practise here. 7 Pages of Transformations Here. 4 Grammatically Themed Exercises Here. 12 Pages of Transformations. Here. 5 Pages of Transformations Here. Visit the Listening Page for two C2-level exericises to help you work on your listening skills. A complete review and introduction to the test is here. Advice on Vocabulary for the Speaking is here. Speaking exam with comments here. Watch the video, perhaps in parts. Make a note of where you think the candidate succeeds or needs to improve. Take a look at the PDF comments below to see the official opinion. Look for the Test Yourself logo to find exercises to help you review what you need for the exam. Advanced (CAE) can help too! Of course you're doing a higher level exam, but that doesn't mean you can't take advantage of our links to CAE exercises and material. Pop over to the Advanced Hub, or browse the Alphabetical Archive (on the right of this page) to get an idea what you should already be quite comfortable with!